I’ve done long-distance running for many years now, for exercise and fun. 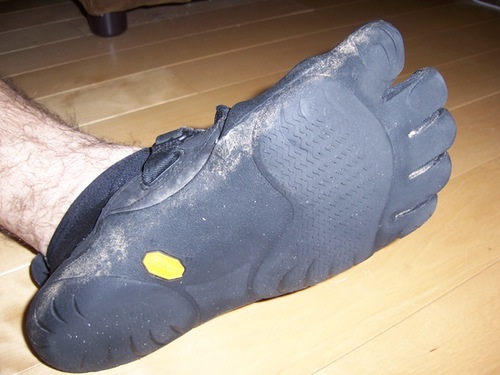 In the fall of 2009 I switched away from wearing traditional running shoes, instead opting to try the new Vibram FiveFingers (sometimes known as “Five Fingers” or “VFFs”), specifically the KSO model seen below. Perhaps you’ve seen some of the articles on barefoot running, or Christopher McDougall’s book Born To Run, and been intrigued by the idea. The FiveFingers are designed to match the physical experience of being barefoot, while still providing a protective sole for the bottom of your feet. 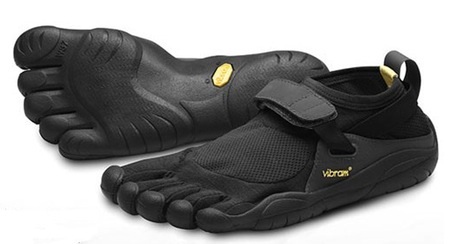 So after six months with them, how do I feel about the Vibram FiveFingers, I’m pretending you’ve asked? Allow me to answer your imaginary question, and review the Vibram FiveFingers, with a Pro/Con list. Hell, this is my site, I’m gonna do it anyway. Pro: I’m wearing gloves, on my feet. Foot gloves! Con: Whenever I talk about my foot gloves, people are all “What the hell are ‘foot gloves’?”. Pro: I look like I have gorilla feet when wearing the FiveFingers. 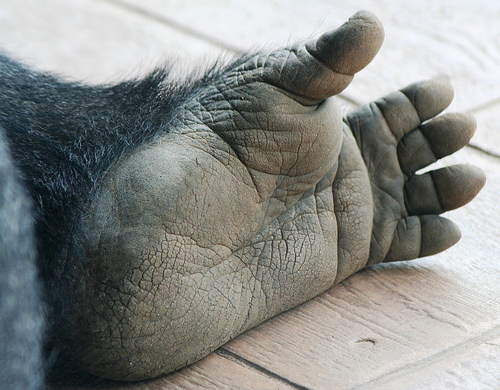 Con: Unlike true gorilla feet, the Vibram FiveFingers do not grant me an opposable big toe. Pro: I feel like some kind of awesome superhero when I wear the FiveFingers. Con: While I have been running faster, a 7:30 per mile average would make me the slowest Flash ever. Pro: Thin soles make the FiveFingers perfect for nighttime cat burglary and other skullduggery. Con: Kleptomania is a serious problem, and these shoes are an unhealthy enabler. Pro: Cute, fit girls want to talk to me about my strange and interesting shoes. Con: Everyone else on the road wants to talk to me about my strange and interesting shoes. Pro: I no longer need to wear socks when I run, which means ever-so-slightly less laundry. Con: When I return from a long winter run here in Boston, it’s not possible to know if I’m still wearing the shoes or I just have hypothermia1. Pro: Speaking of laundry, the shoes are machine-washable and can be air-dried, leaving them clean and stink-free. Con: My all-in-one washer/dryer spins even during the wash cycle, so it always sounds like there’s an angry dwarf trapped in there. Pro: The FiveFingers are extremely light and portable, making them easy to take when traveling. Con: My stupid brain can no longer summon up an excuse to avoid running while traveling. Pro: The snug, nearly-custom fit means you get to measure your feet to see what size you need. Who doesn’t like measuring their own anatomy? Con: This also means you’ll wear a strange size, like a 41. That just sounds ridiculous! Pro: The aforementioned nearly-custom sizing2 of the shoes means they’re unlikely to be stolen. Con: The jealousy of people with ill-proportioned toes, or just extra toes, is an ugly thing to behold. Even uglier than their disgusting, misshapen feet. 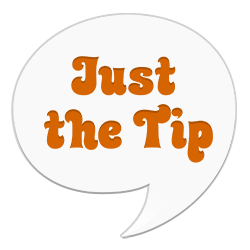 Pro: The Vibram FiveFingers are relatively inexpensive compared to most running shoes. Con: Nevertheless, I have effectively paid $80 to not wear shoes. All in all, I think the Vibram FiveFingers are pretty great, and I’d definitely recommend them to other runners. You’ll need to ease into them, and at times you may be forced back into normal trainers due to weather, but once you start using the FiveFingers, you’ll find they’re great for running, hiking, and more.